Both energy sector counters have been quite volatile and the trend seems to continue this winter season. Natural Gas was seen trading in green yesterday on MCX but today morning lost all its shine. We have seen Natural gas counter gaining around 16% momentum this week and a profit booking was expected. 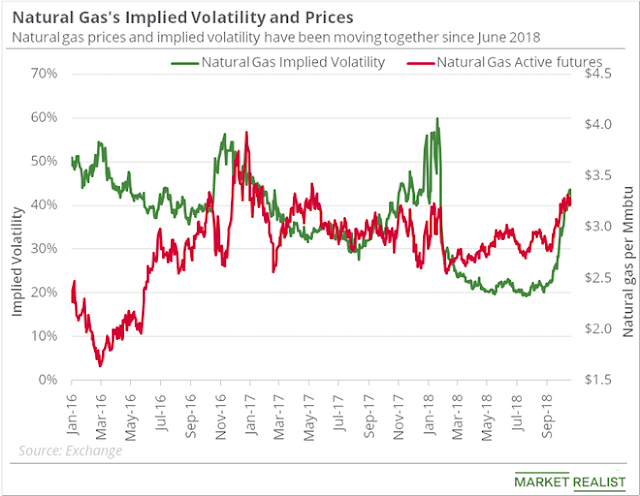 Natural Gas is a seasonal commodity and is following an uptrend based on the natural gas weather reports which predicts much colder than normal throughout most of the mid-west according to the latest forecast from the National Oceanic atmospheric Administration for next 2 weeks. Crude Oil was seen in surplus on 2018 but this trend is expected to reverse according to a new report from Bank of America Merrill Lynch. Natural Gas was seen trading in red this morning and opened down with a gap above. Looking at the weather reports and supply situation, bullish traders were seen dominating the market. Although, we saw prices rebound at the resistance and the international market couldn’t break $3.6. Despite export hit the record number in December which added demand, Natural Gas couldn’t break the resistance. We can expect prices to trade in a range for this week. The range from NG is 230- 265 for Jan contract. We can expect some more profit booking today and prices could move down to 235. Looking at the candle stick for the trading session on Tuesday, it looks likely that the market participants also recognize that we had gotten ahead of ourselves. 232 underneath is a support level and we can prices around that range. I would suggest selling at around 245 for target of 236 with stop loss of 255. For bullish traders, I would suggest buying at 235 for target of 250 to 260 with stop loss of 229. Would recommend traders to hold their position for short-term since NG is quite volatile. As mentioned earlier in one of my post, Crude Oil prices have limited upside, we saw prices being whipsawed recently. Based on a new report released by Bank of American Merrill Lynch, oil prices had collapsed in late 2018 not only because of an oversupply problem, but also because of other “non-fundamental factors,” including the selloff of long positions by hedge funds and other market managers, as well as by fear and uncertainty in broader financial markets. For intraday, I would recommend selling Crude Oil today at 3730 for target of 3640 with stop loss of 3750.